Travelling by train from Seoul to Busan was very easy - collect tickets and board train, couldn't be simpler. We arrived at the hostel (easily one of the nicest we have stayed in) and headed out to the beach. Today would be the only day where we didn't have to deal with torrential rain, so making the most of it was vital! 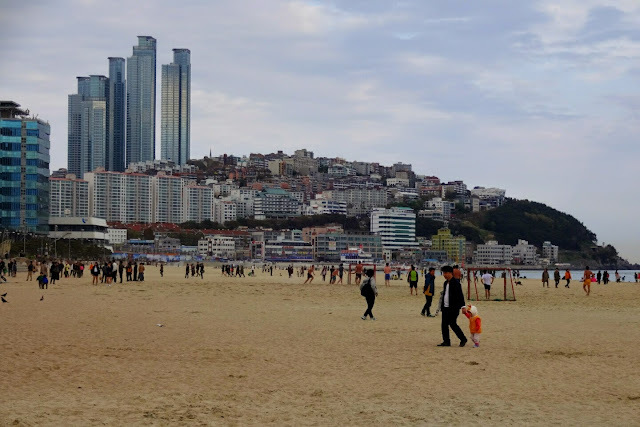 It wasn't warm enough to sunbathe but there was a 'moonwalk' around the edge of DongBaek Island which provided beautiful views of the beach and the ocean. The beach was a beautiful yellow sand and the ocean looked almost blue - definately not what I had expected! When we awoke the next day the rain was torrential, our weather app told us that there was a 100% chance of rain every hour throughout the day and it seemed to be correct! 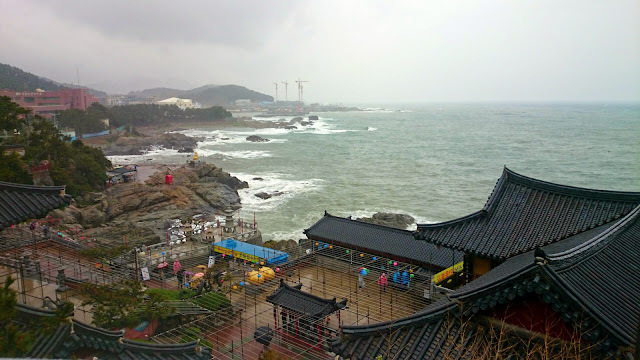 We still wanted to see Busan but changed our plans to go to more indoor places, in the hope of not getting too wet! Unfortunately, the walk to the metro was enough to soak our shoes. Our first stop was the United Nations Memorial Cemetry Korea. This Cemetry was the final resting place of 2,300 people, 885 of which were from the United Kingdom. 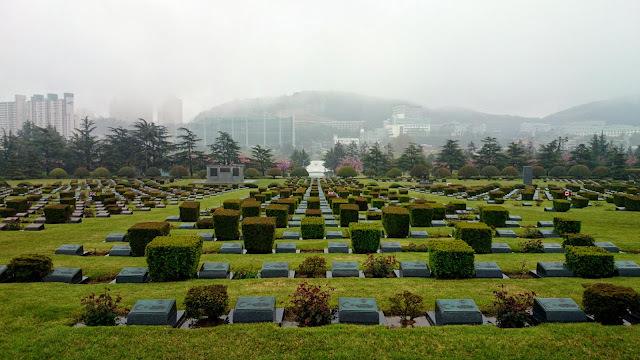 Seeing such a large number of graves was really shocking and this was only 6% of the total casualties of UN soliders during the Korean War. The wall of remembrance really emphasised the number of dead. When you hear there were 40,000 casualties it seems a lot, but it is just number. When you can physically see 40,000 names, that number becomes a lot more real and the gravity of the situation hits you. 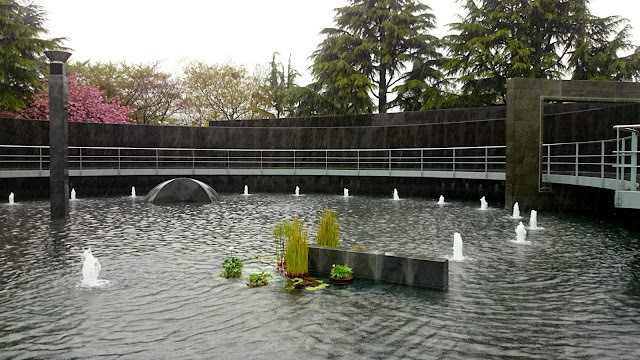 It was a really sad place, but beautifully designed to show its respect to the fallen. We left the memorial for the Busan Museum (by now we were really wet) but at least it was indoors. 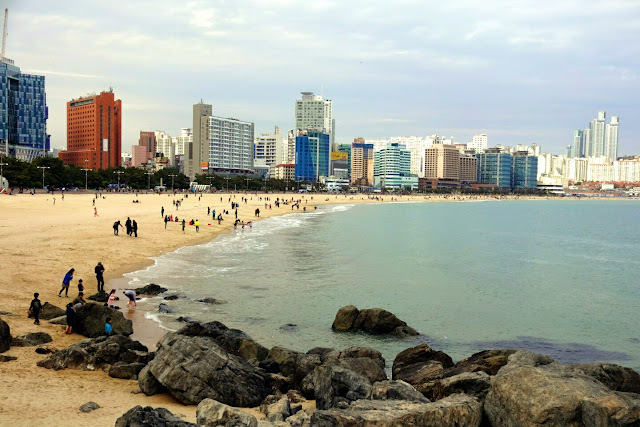 The museum was okay, but mainly focused on Busan Culture prior to the 16th century Japanese invasion. This isn't an area we have learnt much about and so much of the information was lost on us. Instead we may have spent more time on their free WiFi than looking round the museum. Our final stop was the worlds biggest department store in Centrum City. It was home to many beautiful jewellery store and leather good brand's. For the first time we found premium brand's with prices cheaper than England. Unfortunately, we didn't stay long as, once again, we were unable to find any vegetarian food. Instead we went back to the Irish pub where we ate the day before! The next day we woke up and it was still raining. The weather app made it sound like it would be lighter than the day before, but when we left we discovered that it was not. 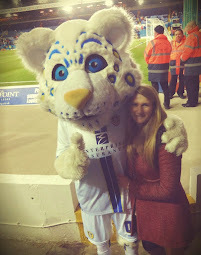 It was also colder than the day before which was really unfortunate. 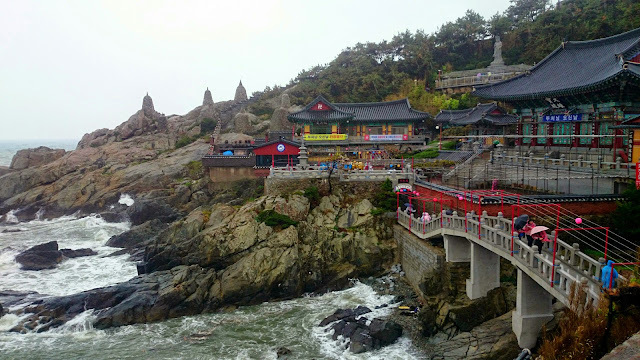 We decided to head out to Busans number one tourist attraction (as ranked by tripadvisor) - Haedong Yonggung Temple. It was very pretty and located on the side of a hill overlooking the ocean. However, the weather was too bad and my feet too cold (from yesterday's wet shoes) so we didn't spend a great deal of time there. When we got back to the hostel, we spent most of the day watching TV and films. 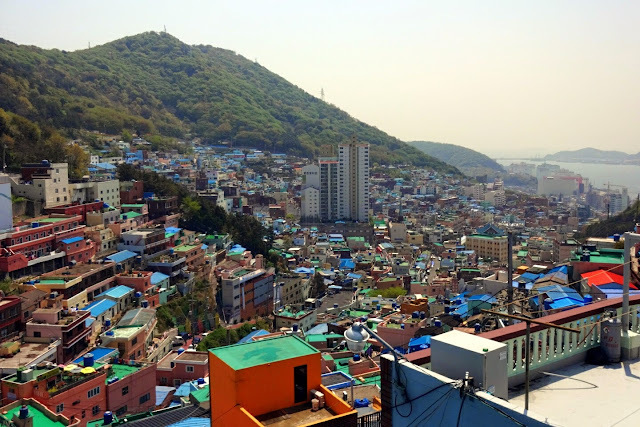 On our final day in Busan we woke up to beautiful weather - typical. We had around three hours to explore somewhere before we needed to head to the airport. Unfortunately (the same old story whilst in Busan) not everything could go to plan - we had to carry our heavy rucksacks with us! We went to the Gamcheon Cultural Village. This was where war refugees went and set up new hones during the Korean War. 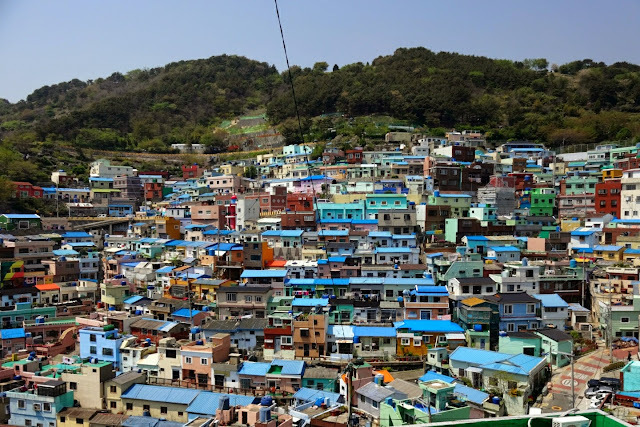 Now it is a colourful village of individual homes. Due to the weight of our bags, we were unable to walk around the entire village (it was very hilly!) but we were able to get a feel for the unique and beautiful costal village this town had become! When we arrived at the airport we discovered that our flight had been delayed, hopefully it won't be too long to wait! !